Edit: This is an old post from back in January. You'll see a few of these pop up as I shift over from my old blog. If your order totals $150 or more before tax and shipping, don't use the code! You will qualify as a hostess at that point, and you'll receive some nifty hostess perks ON TOP of the Sale-a-Bration goodies! Ready to make something pretty? I thought so. Disclaimer: if you're new to stamping and/or card making, you're going to be learning a few new techniques today. 1 piece of thick Whisper White, cut to 8 1/2" X 5 1/2"
1 scrap piece each of Powder Pink, Tranquil Tide, and Berry Burst - they just need to be big enough for balloons. You'll need an extra scrap piece of powder pink to make a banner. First, we score. Because why not? Have to start somewhere. Put your 8 1/2" X 5 1/2" card stock into your scoreboard on the long side and score it at 4 1/4". Now fold the paper on the score mark and burnish the edge with a bone folder. Boom! There's your card base! Easy, right? Grab your scoreboard and put that puppy away, because you're done with it. Once you've got your mat and your scraps stamped, set aside your mat, the stamp, and your inks. Now you'll need your white mat, your black ink, and the three pandas. Stamp the balloon panda in the bottom center of the mat, the envelope panda on the right of him, and the party hat panda on the left. I made mine a little tilty (yes, that is SO a word! ), but you don't have to. While you have the bears out, go ahead and stamp each of them again onto your scrap paper/post-it-note paper. Then, grab the balloon panda and stamp just the balloon in black on each of your white, berry burst, and tranquil tide papers. You're aiming to get the stamped stars and dots inside the balloons. You can put the pandas away, but grab the Happy Birthday and Hi sentiments, will you? 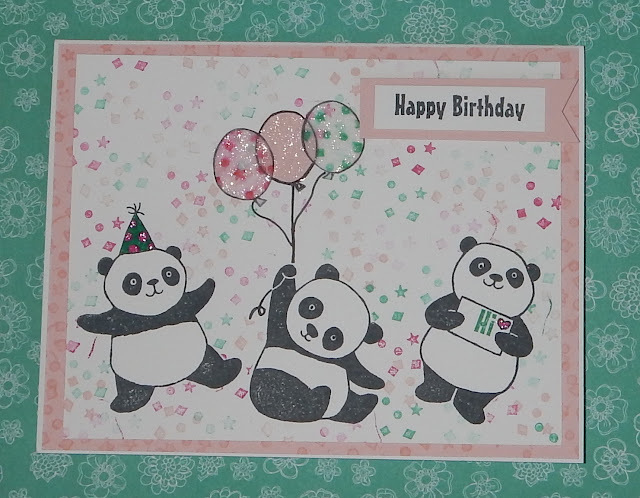 Stamp "Happy Birthday" in black onto the whisper white scrap and stamp "Hi" in tranquil tide onto the little card in the panda's hand. Okay, don't hate me, but we need to do a little cutting before we can be completely finished with our stamping. Using our snips (you'll really want scissors that have short, really sharp blades for this, so don't try using those shears I know you're reaching for), cut out the three balloons and the three pandas. Make sure you get as close to the black out lines as you can. Cut the unstamped powder pink scrap into a small banner and cut the white "happy birthday" piece into a strip that will fit inside the banner. Put all these little pieces in something like a small plastic bowl so you don't lose them, put the snips away, and pull out your white mat again. Remember the extra pandas we stamped? Well, we need them for this next step. Using very low-tack tape (I use cheap dollar store double-sided tape), lightly stick those pandas onto their twins on the white mat. We are creating a mask and we'll need to be able to remove the pandas without tearing our mat - don't worry; it will make sense in a minute. Put the stars and dots stamp on a block and grab the tranquil tide ink. Tap your stamp on the pad, stamp onto a scrap piece of paper, and then randomly stamp onto your white mat without re-inking your stamp. Rinse and repeat a couple of times, until you like what you have so far. Don't do it too much though, because you're going to be doing this with the berry burst and then again with powder pink. You can totally stamp onto and around your panda masks too. Wait 'til you see the cool effect we'll get! Okay, I promise we're done stamping - unless you want to add a sentiment to the inside of your card base. Go ahead and put away all your stamps and the powder pink and black inks. Leave out your berry burst and tranquil tide inks, as well as your white panda mat, and you'll need your aqua painter. Remove the panda masks from their twins - you should now have three stamped pandas with a stars and dots background. Yes? Cool, right?? Told ya. While they're still closed, squeeze the stamp pads a little and then open them - but not all the way. Do you see that ink puddle on the inside of the lid? We're about to paint with that. Pick up some of that berry burst ink with your aqua painter and color in the party hat (not the dots) and the little heart on the envelope. Using the tranquil tide, paint the dots in the hat. Clean off the brush with some water and use a baby wipe and paper towel to clean the inkpad lids. You can now put away everything except your card base, mats, adhesives, and the little balloons you cut earlier. Believe it or not, we're almost done. Put some tear & tape on the back of the two mats, on all four sides. Remove the backing from the white mat and center it on the pink mat; do the same with the pink mat and the white card base. Using the liquid glue, stick down the pink balloon right on top of the stamped balloon in the panda's hand. Attach a dimensional to the backs of the berry burst and tranquil tide balloons, peel off the backer paper, and stick the balloons to the left and right of the pink balloon. Use the journaling pen to draw strings from the balloons to the stamped string. Attach the white sentiment piece to the pink banner using liquid glue, and attach three dimensionals to the back of the pink banner. Peel the backer and place the banner on the white mat, to the right of the balloons. I really hope you enjoyed making this card and that the tutorial isn't too long or difficult. If you try this project, please leave me a comment and let me know how it went. If there's a project you would like me try, let me know and I'll do my best to make it happen.